So, Dominique and I took the boys to their first away camp in northern New Hampshire. The boys poked each other constantly the entire length of the ride, goading and teasing each other. They were as excited about going to camp as they might be about Christmas or their birthdays. On the way back we decided to stop in and visit the Putney Mountain Winery. 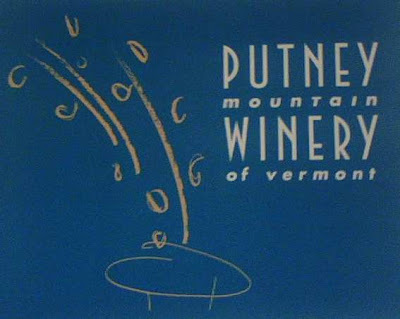 The Putney winery was officially licensed in 1998. And co-owner Charles Dodge, a composer who has taught at Columbia and Dartmouth was there to walk us through a tasting. Charles Dodge, is a very nice, unassuming man. But tht belies an accomplished past. According to Wikipedia, "Charles Dodge (b. Ames, Iowa, June 5, 1942) is an American composer best known for his electronic music, specifically his computer music. He is a former student of Darius Milhaud and Gunther Schuller...Dodge received his undergraduate education (BA) at the University of Iowa, and earned his MA and doctorate (DMA) at Columbia University. In the 1970's he taught at Columbia and subsequently founded the Center for Computer Music at Brooklyn College of the City University of New York where he was Professor of Music. He also taught at the City University Graduate Center. Currently, (2008) he holds the position of Visiting Professor at Dartmouth College. In addition to his work as a composer, Dodge is noted for co-authoring the highly praised book Computer Music: Synthesis, Composition, and Performance, ISBN 0-02-864682-7  Best known in recent years as the owner, with his wife Katherine, of the Putney Mountain Winery in Putney, Vermont. The company has experienced growth every year since its founding in 1998." Darmouth's faculty page has this about him: "Inaugurated the graduate study of computer music at Columbia University where he taught in the music department from 1970-1980. Subsequently, he founded the Center for Computer Music at Brooklyn College of the City University of New York and taught at the City University Graduate Center. He has received a Woodrow Wilson Graduate Fellowship and two Guggenheim Fellowships as well as numerous commissions and awards for his compositions. Dodge is best known for his many electro-acoustic works incorporating speech synthesis and for a series of works that combine computer music with live performance. With Thomas A. Jerse, he is co-author of the leading textbook in the field, Computer Music: Synthesis, Composition and Performance." But his bio on Albion Records is even more impressive: "Charles Dodge New Albion Records...Charles Dodge received recognition early in his career for his orchestral and chamber music. He went on to become one of the first composers to realize the immense potential of the computer for broadening the scope of musical composition. He was experimenting with the digital synthesis of sound as early as the late 1960s, splitting his time between between Princeton University, Columbia University, and Bell Labs. He completed Speech Songs in 1972, making a mark on the new music world with his charming and humorous use of synthetic speech. The work, created in the early days of computer voice synthesis at Bell Telephone Laboratories, paved the way for everyone from Kraftwerk to Add N to (X), and is considered a computer music classic. Ingram Marshall writes of Dodge's music, "The wit is always subtle, and there is a cool clarity in his expressive use of computer timbres and intervals which often give a chilling edge. There is never a surfeit in the music, yet one could hardly call him a Minimalist, nor, for that matter, any other label such as New Romantic, Serialist or Cagein Aleatoricist! Happily he avoids pigeonholing, yet his music has a recognizable quality that identifies him readily enough."" We just like him for his wines. Who knew? 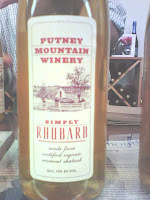 We started tasting with the Cranberry wine, and then moved on to the Simply Rubarb. Dominique is a big fan of rubarb itself. And this wine was no disappointment. A big nose full of rubarb, with nice flavor and nice acidity. This is not a very sweet wine. Very nice. For folks who like rubarb or rubarb wine, this is a nice one! But don't just trust me, how about this quote from Howard Weiss-Tisman, of the Brattleboro Reformer, who recently wrote, "For the second time in three years a wine from Putney Mountain Winery has been named the best in the state at a regional competition...Putney Mountain Winery's 2006 Rhubarb Blush received a gold medal and was named the best wine in the state of Vermont at the 2008 Big E Northeast Gold Medal Wine Competition. The Big E is New England's largest agricultural fair and is held each year in West Springfield, Mass." That's an accomplishment! Next was the Apple-Maple wine. We liked this very much. Tart and sweet with just a touch of maple at he end. This would make a great spiced wine too! This was one of our favorite wines. Ruhbarb Blush was the next wine. This is a ruhbarb wine made with strawberries and maybe a touch of raspberry. 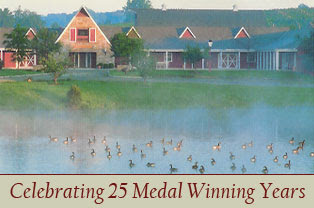 This was the 2008 North Eastern gold medal winner, which is one of the highest awards that can be won by a New England winery. This is a lovely blush wine. Really a fun, delicious easy drinking wine. This wine is a winner in more ways than one! Next was the Vermont Cassis. This was a dark, inky, sweet and tart. An excellent Cassis!! Really one of the better bottles of cassis I have had from the east coast! Really wonderful! They also make a wonderful sparking apple wine. Not a cider. But an apple wine that is then turned into a sparkling wine. Very dry. Very nice. Made with local MacIntosh apples. Dominique and I had a very nice visit. And Charles Dodge is one of the nicest poeple you'll ever meet. And he is an inertesting individual as well, straddling the worlds of music, academia, and wine. The wine business does attract creative indivualists! Congrats, Charles! Lenndvours, as you wel know, is one of my favorite wine bloggers. Here's the article he just recently wrote on a new Long Island Winery. As the Long Island wine community has moved into adolescence, several smaller wineries have popped up on the Island — some focusing on a single style or even one wine. Sparkling Pointe, for instance, has released it's first — you guessed it — sparkling wines. And, Medolla Vineyards, for now anyway, is making merlot. 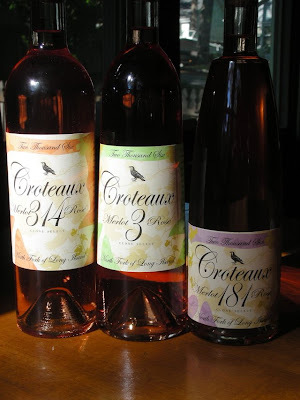 And then there is Croteaux Vineyards, a new producer owned by Michael and Paula S. Croteau. They focus solely on merlot-based rose wines, and they make three of them. While a new winery, Mr. Croteau is no stranger to Long Island wine scene. As creative director of Croteau Design, he has designed logos and labels for many local wineries. His eye for design comes through not only in the labels for his own wines, but also in the bottles themselves, two of which are uniquely shaped. The Croteaus grow merlot, cabernet franc and sauvignon blanc in their their 10 and a half-acre vineyard, which was planted in 2003, selling about half of the fruit to other wineries — namely Channing Daughters Winery and Scarola Vineyards. For their own wines, they turned to industry veteran Richard Olsen-Harbich, who makes the three roses that comprise the Croteaux portfolio at Raphael in Peconic, where he serves as winemaker. You try hard to be today’s green consumer. You buy carbon offsets for your yearly vacations; you shop at local farm stands. Then you go ahead and drink French wine. Have you even thought of the energy it takes to get that bottle from Bordeaux to your back yard? If you’re going green - and even if you’re not - consider drinking locally. It’s not hard at all to find delicious New England wines. 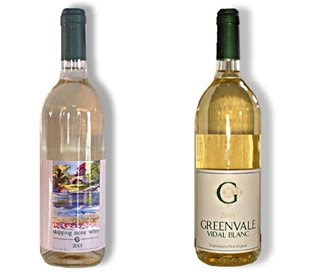 Greenvale Vineyards is a family-run Rhode Island winery that makes a host of whites and reds from fruit grown on its 24 acres. The dry, crisp vidal blanc ($14), peachy Skipping Stone White ($13) and Bordeaux-style cabernet franc ($25) are all excellent bottles to try. Massachusetts’ Westport Rivers winery is well-known for bubblies; the Blanc de Blancs (1999, $30) is a sure winner. But it also makes fine still wines, including a light, fruity pinot blanc (2006, $15) and mellow Rkatsiteli (2006, $19). Rhode Island’s Sakonnet Vineyards is another often-touted producer. Its appealing bottles include two variations on vidal blanc: the oak-aged, toasty fume vidal (2006, $16) and a honeyed Winterwine (2005, $25). Running Brook Vineyards is one of the newer New England wineries, and its bottles are harder to find. But its un-oaked chardonnay (2005, $10) - clean, bright, fruit-forward - is well-worth the hunt. Or even the energy-burning drive down to North Dartmouth. Why not minimize your gas-guzzling, and visit several local wineries on the same trip? Check out coastalwinetrail.com for directions to these and more. Wineries are hot spots for tourists. But for Maine’s emerging wine industry, success is a group effort. A 50-foot Ferris wheel peeked over the roof of the main building at Cellardoor Vineyard on May 9, making an incongruous addition to the stately winery in its hilltop setting in Lincoln­ville. A crew of men spent a day assemb­­ling the wheel in the back parking lot after hauling it to Maine from Iowa. In the early afternoon, Bettina Doulton, Cellardoor's co-owner, walked out to the back porch for a quick inspec­­tion of the wheel's progress. After an employee tending to a garden dryly told Doulton she had just noticed it, Doulton joked back, "It's easy to miss!" The Ferris wheel was part of the winery's spring festival, held in mid-May to herald the arrival of warm weather and the winery's season opening. This year, more than 800 people came out for the party, perhaps due to the rare chance to take a carnival ride high above growing vines. 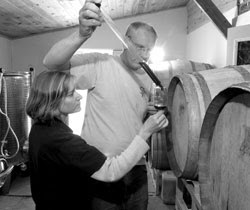 Doulton and John Tynan bought Cellardoor in early 2007 from a couple who had planted the vineyard 10 years prior. From the start, they have opened the vineyard up to the public. "For us, it's not about the sale of wine, it's about connecting with people, connecting people with each other," Tynan says, sitting recently in the cool, dim balcony of the post-and-beam tasting room where he could watch the season's first guests sip Queen Ann's Lace or Vino Divine, or any one of Cellardoor's 11 homemade wines. Doulton adds, "We really love the opportunity to interact with guests around communication, around community. It's about conversation, food tasting, wine tasting." The two are corporate refugees, having left Fidelity Investments in Boston to jump into their winemaking dream after Doulton made a full recovery from breast cancer. At Cellardoor and the other 11 licensed wineries in Maine, now is the season to open the doors, dust off the bottles and let the wine flow. During summer and fall, most Maine wineries sell between 50% and 95% of their bottles from their tasting rooms. Vintners say they can pull in as many as 50 to 200 visitors on a busy day, tapping into the deep reserves of tourists who flock every summer to Maine, and especially to the midcoast, where the wineries are concentrated. For most of the Maine wineries — many of which are fairly young — attracting visitors is essential for survival. Elmer Savage, the co-owner of Savage Oaks Vineyard and Winery in Union, says two-thirds of the farm's visitors are tourists, and 95% of the farm's wine is sold on the premises to tourists and locals. Elmer and his wife, Holly, are now making 10,000 bottles — or 2,000 gallons — of wine a year, six years after planting their first vine. What they don't sell at the vineyard gets sold at local retail stores. Last year, Savage Oaks' wine sales hit $40,000 — double the previous year's revenue, and about two-thirds of the farm's total revenue. (Besides growing grapes, the Savages also raise cattle and pigs and sell pork, beef and blueberries on their 95-acre farm.) "At our size, we couldn't make it without having people come right to the farm," Elmer Savage says. Maine's small wineries aren't likely to grab a large share of the global wine trade. For starters, oenophiles aren't yet embracing Frontenac or St. Pepin as the next great wine grapes. But the main reason is that Maine wineries just can't produce enough wine to fill more than a local demand. What's more, Maine wineries are hurt by state laws prohibiting shipments of alcohol via mail or the Internet, unlike 25 other states that allow interstate wine sales. This makes on-premise sales all the more vital for wineries that have not yet established a widespread presence in shops, grocery stores or restaurants. Plus, selling bottles from the winery itself means higher margins for vintners. The key for these wineries, then, is to make the wine-tasting process an experiential one, and to lure tourists off the beach and into their tasting rooms. And once those tourists are in the winery, they typically leave with a bottle or two — or better yet, a case — of the wine. Bob Bartlett, co-owner of Bartlett Maine Estate Winery in Gouldsboro, says wine tasting is becoming more and more an essential rite for tourists when visiting a new area, like having to eat a lobster in Maine or fish-and-chips in England. "Tourism is extremely important in this business," he says. "Historically in Maine, most of the business is tourism, and that applies to wineries." A pioneer of Virginia’s wine industry announced Wednesday that she is retiring after 25 years and closing her Albemarle County winery. Felicia W. Rogan, owner and founder of Oakencroft Vineyard and Winery, is selling her 250-acre farm off Garth Road, including its 15 acres of vineyards. Rogan declined to identify the farm’s buyers, who are have placed the property under contract. However, Rogan said that she does not believe the new owners are interested in keeping the winery running. 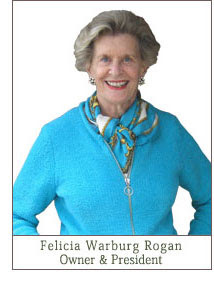 Rogan opted not to disclose her age (she calls it an “unlisted number”) but said the time had come to shutter her business, which is the oldest operating winery in Albemarle County and is the closest to Charlottesville. When Rogan opened Oakencroft, it was one of only five wineries in Virginia. Today, the state has more than 100 wineries and is ranked fifth among America’s grape growing states. “I’ve always thought that we could become the Napa Valley of the East,” Rogan said. Rogan — who former Virginia Gov. George L. Baliles once called the “matriarch of the modern-day wine industry — helped found the Jeffersonian Grape Growers Society and served on countless wine promoting boards and commissions at the state and local levels. Her efforts helped lay the groundwork for the Virginia wine industry to grow into what it has become today, said Ann Heidig, president of the Virginia Wineries Association. 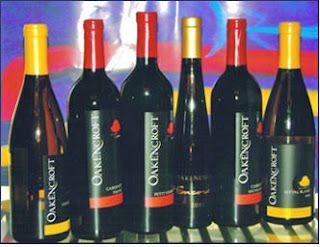 Oakencroft’s wines have steadily improved over the years, said Robert Harllee, owner of the Market Street Wine Shops. In last year’s Virginia Governor’s Cup Wine Competition, the winery’s 2005 Encore won a gold medal, its 2006 seyval blanc won a silver, and its 2006 viognier earned a bronze. “They’re definitely going out on a high note,” Harllee said. The Harrisburg-based Pennsylvania Winery Association has formed a legislative caucus dedicated to promote and support the state's wine industry. The first meeting of the Pennsylvania Winery Caucus was held yesterday in Harrisburg. The caucus' co-chairs are state Sens. Jane Earll (R-Erie) and Michael O'Pake (D-Berks) and state Reps. Scott Petri (R-Bucks) and Rep. Patrick Harkins (D-Erie). Caucus membership is open to other members of the Pennsylvania House and Senate. "It was a positive meeting," said Judith Nissley, co-owner and president of Nissley Vineyards in Lancaster County. "(The legislators) can help us with the interests of our industry." One of the caucus' goals is to promote "Vintage 2012," a five-year plan designed to increase the financial impact of the state's wine industry. The industry contributed $661 million to the state's economy in 2005, according to a study commissioned by the Pennsylvania Wine Marketing and Research Board. Since 1998Arrowhead Wine Cellars owners, Nick and Kathy Mobilia, have been producing internationally recognized award-winning wines. Mostly, all grown on the Mobilia's 250 acre farm in North East, Pennsylvania. Arrowhead Wine Cellars boasts one of the Lake Erie Region's largest winery gift shops, featuring unique and one-of-a-kind gifts from New York City and around the world. Adjacent to Arrowhead Wine Cellars you'll find Mobilia Fruit Market. At the farm market you can either "pick your own" or purchase already picked fruit in season. The farm market also features frozen fruit, fresh grape juice, home wine making supplies and a wide variety of jams and jellies. Open Monday through Saturday 10-6. Sunday 12-5. Winter and Spring hours vary. Closed all major holidays. 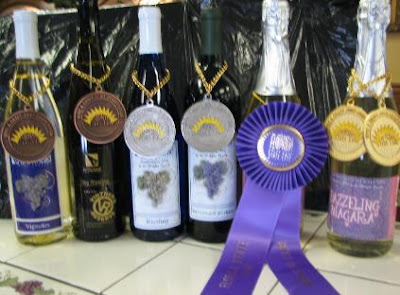 "Best of Show for Sparkling Wine - Dazzeling Niagara"
"Best French Hybrid Variety Wine - Arrowhead Wine Cellars Vignoles"